Spring is just around the corner. It's time to plant and nurture seeds of health and vitality. Our yoga practice is one fruitful way of doing so. Invite all that you love about Spring, the reinvigoration, rejuvenation, re-energizing and rebirthing, to manifest in your whole being. The Spring Series of Village Yoga, beginning April 1st through June 27th will include 10 sessions instead of the usual 12. Therefore, the fee for the series has been discounted to $150 (drop-in classes remain at $20). All classes meet in the Parish Hall of Christ Church, 64 South Country Rd., Bellport. Cost: $150 for entire 10 session series. Drop-in Classes are $20 per class. 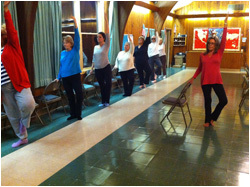 Dynamic Chair Yoga, led by Nancy Norman of Village Yoga, has been a tremendous success and service to people with limited mobility who know the importance of keeping the body moving. In addition to the adapted yoga postures (asanas) and breathing exercises (pranayama), this series of classes will include teachings on health and wellness. Each week there will be a brief teaching about a specific health issue or medical condition, along with yoga postures and breathing techniques that address these issues. Some of those to be included are: Enhancing and Strengthening the Immune System, Blood Pressure, Stress Transformation, Heart Health, Joint Safety, Chronic Pain Relief, Emotional Health, Maintaining Bone Mass, and Balance. Please specify for which class you are registering. If you have any questions or concerns you'd like to discuss, please do not hesitate to contact Nancy via e-mail at nancyoga@optonline.net or phone at 631-286-0035. The following video was recorded at the April 2016 meeting of The Fireplace Literary Club where Nancy Norman spoke about “The Benefits Of Yoga For People Of All Ages And All Body Types.” Woven into the presentation is 16-minute Dynamic Chair Yoga demonstration you won’t want to miss. I am very excited to announce that I have been accepted into a program at Duke University's Integrative Medicine Department. Major medical schools throughout the country have been conducting amazing research on specific health benefits of yoga and how yoga addresses specific medical conditions and promotes healing. In conjunction with its research, Duke is offering a training for a limited number of certified yoga teachers in "Yoga Therapy for Seniors." This is the next exciting step in my education. To release stress. Yoga is one way of repairing the body and allowing it to recover from stress disorders. To learn to listen to the wisdom of your body as you stretch, relax and rejuvenate. To increase flexibility and ease of movement. To open and expand from within, creating more space for abundance. The goal of yoga is not perfection; the goal of yoga is wholeness. 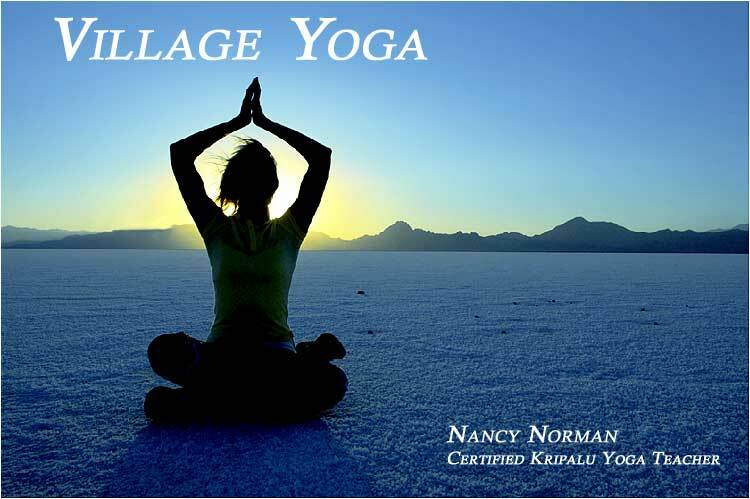 Village Yoga is owned and taught by Nancy Norman, a professional-level certified Kripalu Yoga Instructor since 1995. Nancy believes that (re)discovering "new" territory within the self leads to a larger experience of life. In all of her classes and workshops, her intention is to create and hold a safe and inspiring space in which to explore and expand the Self. Nancy’s passion is teaching. 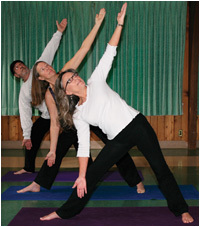 A high school English teacher for 30 years and a New York State Teacher of Excellence, she began teaching yoga to faculty and staff in Smithtown School District in 1995. Having earned her Kripalu Yoga Teacher Certification in 1995, she continued (and continues) her inquiry and study of yoga leading to her 500-hour, professional level Kripalu certification. 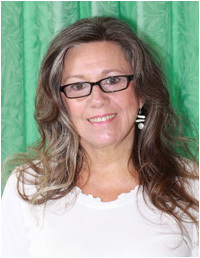 Besides teaching in the Graduate School of Education at Dowling College, Nancy has developed and taught many workshops, including a SCOPE course weaving yoga, writing and psychology in Writing from the Core, Releasing Stress through Yoga, Understanding the Chakra System, Breathing Techniques to Enhance the Quality of Life, The Art of Excellent Listening, Pranayama and Yoga as Meditation Practices. Some of the many organizations for which she has led presentations include the Critical Incident Response Team of Suffolk County Probation Officers, Suffolk County Girl Scouts, Integrative Health and Healing Committee of St Charles and Mather Hospitals, Hampton Bays Superintendent Conference Day, North Shore Hematology/ Oncology Cancer Survivors Support Group, National Education Assoc. Summer Leadership Conference, Baha’i Faith Leadership Training. Since 2003 Nancy has been operating and teaching Village Yoga, offering three classes a week in the Parish Hall of Christ Episcopal Church, So. Country Rd., Bellport, as well as, “Yoga on the Bay” at Mothers Beach in July and August. She also teaches private clients by appointment. The hallmarks of Nancy’s teaching are her depth of knowledge and gentle approach, creating safe and sacred space for each individual practitioner. "I am truly amazed by the process and results of each class. It provided a format for a total experience --- body, mind and soul. Wonderful (full of wonder) is perhaps the best word to describe it . . . One of the greatest gifts I have received is of affirmation, connection and joy.” - Linda G.
“Thanks for having so much patience and for introducing me to one of the best things I’ve ever done for myself. I hope I’m able to keep practicing for a long time.” - Debbie S.
Dynamic Chair Yoga is ideal for people of all ages with limited mobility. Whether as a result of injury, surgery, disability, aging, sedentary lifestyle or simply sitting at a desk or at a computer for long hours, one may discover loss of flexibility and the gradual, but profound, negative impact of that loss. Most people these days know that practicing yoga is a highly effective antidote with multiple benefits... emotional and spiritual, as well as physical. But many folks also believe that yoga means being able to put your body into the shape of a pretzel or at least being able to get down onto the floor and back up again with ease. Therefore, those who cannot move from posture to posture, getting down and up again from the floor, may hold a false and personally limiting belief that yoga is just not for them. Because as a child I was not naturally flexible as my playmates, for many years I believed I was not a “yoga-type person” (whatever that is). Based on 16 years of teaching Kripalu Yoga, I now know that yoga is perfect for every body and every body is perfect for yoga. According to Wikipedia, “Chair Yoga is the term generally used to describe a gentle form of yoga that is practiced sitting in a chair, or standing using a chair for support.” In Chair Yoga traditional yoga postures known as “asanas,” are adapted so that all areas and systems of the body can experience the benefits of yoga. These asanas help stretch, or open, the neck, shoulders, arms, wrists, hands, rib cage, the entire spine, hips, knees, ankles and feet. This opening releases tensions stored in various parts of the body and creates spaciousness, allowing the healing power of “prana,” the life force, to move freely throughout the body. Incorporated into the practice of asanas is “pranayama,” or breathing techniques which enhance and deepen the effectiveness of each pose. The key to gaining the full benefit of a yoga session is to make sure you breathe deeply, fully, and in coordination with the movement of the limbs. Combining yoga postures with the breath benefits you at the core level of physical functioning: cellular metabolism. This is because the yogic breath delivers increased oxygen to your cells while the movement and holding of postures improve circulation, removing waste materials that impair efficiency. In addition to improving metabolic exchange that each cell depends on for optimal functioning, the muscular stretching and rhythmic pressure caused by the breath have a profound impact on the detoxifying mechanisms of the body, including the lymph system, kidneys, lungs, skin, and elimination components of the digestive system. This explains the feeling of freshness after yoga and the light or clarity you see in people’s faces following a class. Finally, the heart, as the largest involuntary muscle of the body, greatly benefits from yogic breathing practices and from the relaxation experienced in the muscles during yoga, allowing the whole cardiopulmonary system to reset to a healthier rhythm. In addition, whenever the head is lower than the heart --- in postures like seated forward bend and chair-supported downward dog --- the whole circulatory system gets a rest. The walls of every fluid-containing tube in the body gain a reprieve from the constant fight against gravity. We haven’t even begun a discussion of the benefits beyond the physical. Neurobiologists have been studying the interaction between the body and the mind, and their findings show what yogis have been saying for thousands of years: functionally, the body and mind are inextricably bound together. The mind is a subtle body and the body is a gross mind. You can think of it like fingers in a glove; when you move your fingers, the glove moves; if you move the glove, your fingers must move also. This insight is the basis for the revolution in psychiatry over the last two decades and the reason why the standard treatment of mental disorders now consists of tinkering with the organic blood chemistry system rather than the psychological and emotional constructs; more often than not, when you go to a psychiatrist, you get a prescription rather than a dialogue. This interweaving of body and mind also helps explain yoga’s effectiveness. Many people in chair yoga classes have health issues, and are there because a health care professional that knows about their problems recommended it. A good chair yoga teacher will ask about, and be aware of any limitations the student might have. 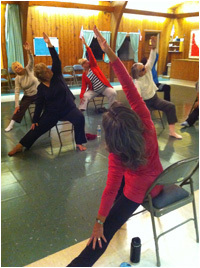 Chair yoga has helped people with the symptoms of many health issues including: COPD, hypertension (high blood pressure), anxiety, chronic fatigue syndrome, arthritis, vertigo (medical), multiple sclerosis, carpal tunnel syndrome, clinical depression, and chronic pain. 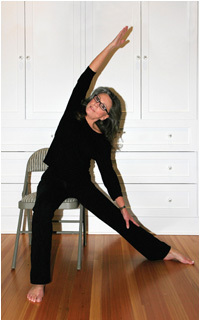 Chair Yoga is a gentle, accessible approach to learning yoga, an ancient science of well-being. Although complicated maneuvers and complex movements are not present in a chair yoga class, it is not a “watered-down” form of yoga. What is present is an atmosphere of unconditional acceptance and care, creating safe and sacred space for each individual practitioner. Private sessions are also available by appointment. Call 631-286-0035 for details.